Steven Kraan is a comic artist from Rotterdam, The Netherlands. His name was given to me by David Litchfield for The Say Anything Project. I was looking for a few more kind, talented artists to complete the project and Kraan delivered three times over. Steven’s piece was ‘Mara and Me’. 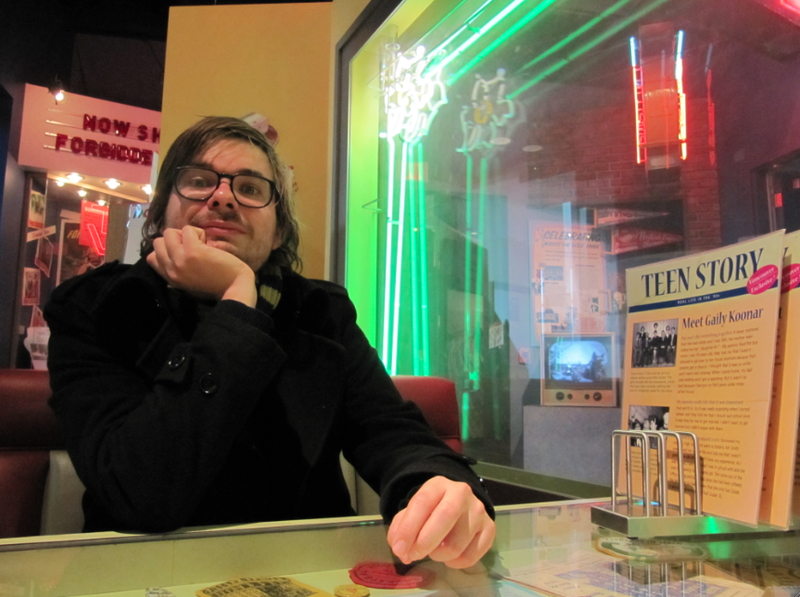 He recently relocated to Vancouver with his girlfriend, and I sought out to ask him about that big change and then some. Tell me a bit about where you grew up, please. I grew up in an unpronounceable city called Capelle aan den IJssel, a city glued to Rotterdam, in the Netherlands. Childhood was with its ups and downs: school, hating gym, playing outside together with the neighbourhood kids until dawn, breaking my arm, getting a NES, ditching my friend for videogames, playing cards with grandma, fighting with my sister, watching The Simpsons with my sister, being bullied for getting high grades, family holidays, falling from my bike and breaking my front teeth and drawing a lot in between. When did you learn being an illustrator was something you could do? I have no idea, but I’ve always enjoyed drawing and if I don’t do it I’m sad. Drawing is how I best express myself and it allows me to make sense of the world. How did ‘drawing daily’ come about? I had an inactive Facebook account. When I started using it again, I mainly posted drawings on my wall. At some point I wanted to reach more people besides my friends, so I started a Facebook page called ‘drawing daily’ with the intention to post a daily drawing and reach a wider audience. It was also a way to train myself in drawing more and hopefully improve my skills while at it. What was your first ‘drawing daily’ comic? I think the first drawing daily drawing was a videogame inspired series about the seven sins. 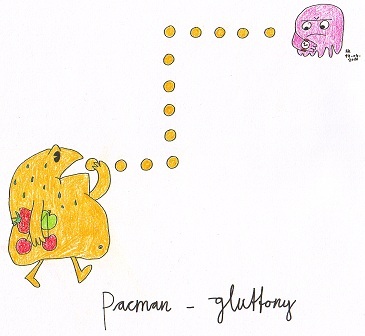 It was a drawing about an overweight Pac-Man titled ‘Gluttony’. 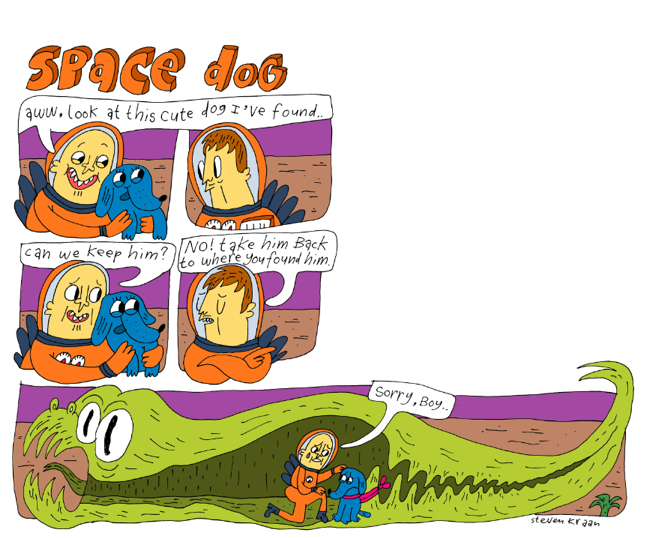 The last thing I drew was a comic about two cosmonauts and a space dog. The cosmonauts are characters I use a lot in my comics; I really like to use returning characters in my work. My comics are usually 1 page gags, but by using characters more often than once, you create a background for them, allowing you to make more layered work and creating a ‘world’ which grows with every new comic. Would you say it’s easier for you to show than to say? Yes. While making comics, coming up with the ‘right’ words that go with the drawing is the most difficult part for me. You recently moved to Vancouver, what was that process like? After visiting Vancouver for a holiday last year, my girlfriend and I decided we really wanted to return to this city and live there. The preparation in advance was a tough process: sorting out our stuff, saying goodbye to friends and family, cancelling subscriptions, getting a working holiday visa, switching health care etc. It was a stressful time but it also felt relieving to sort out your belongings and leaving with only the bare essentials. Sitting in the plane to Vancouver was the first time in months we could relax and get excited about moving to Vancouver. The space there is in Vancouver compared to the Netherlands, the wild nature which surrounds the city, the friendliness of the people living here and the relaxing laid-back vibe which hangs in the air. What are you glad you left behind in Rotterdam and what are you sad about leaving behind? Rotterdam is a great city. I think what we left behind is who we were in the Netherlands and started with a fresh start in Vancouver. Like snakes, leaving behind their old skin in order to make room for a new one. I’m sad leaving behind a city filled with amazing architecture, a great film festival but mostly my friends and family. Luckily with Skype and social media other countries are just a mouse click away. What’s the most exciting/interesting/memorable trip you’ve taken so far? Coming to Vancouver, settling in a new country, a new city, a new community has been one big exciting, interesting and memorable trip. Every day is filled with new things and experiences, it feels like an extended holiday that never ends. When I’m not drawing I’m working at an art supplies store in downtown Vancouver called Opus. I can’t really think of a nicer place for me to work at. I’m surrounded by great art materials and meet new interesting people every day who are involved with creative projects. Besides drawing and working, me and my girlfriend love to explore this ‘new’ city. We do this by walking around a lot, discovering new neighbourhoods, forests, museums, theatres, parks and everything else Vancouver has to offer. And if there is some time left, I love to watch series (at the moment we are in the middle of The Wire). What do you think is the most important lesson you’ve learned? That it’s good not to stick around too long in one place. There is a whole world out there, and I hope to see as much of it as possible, meeting people and learning about other cultures. It is also nice to realise you’re flexible as a human, getting used and adjusted to new surroundings. Vancouver is great, but definitely not the final stop. That things are bound to get better. Because there are difficult times, there are great times as well (no ups without downs). I hate when…I didn’t write down an idea for a comic. I often ask myself…aren’t I’m lucky that I am still healthy and alive. I hope to…enrich myself and those around me.